Please contact the webmaster on how YOU can contribute and make an impact on our research! Below are links to events and meetings, newsletters, important publications, research web sites and other recent items of interest to the Chironomid community over the last year. If you know of something that would interest the chironomid researcher, please let the webmaster know about it so that it can be included. Wenbin Liu writes to inform us that the 2nd Symposium on Chironomidae in China (link to download PDF) was held at Tianjin Normal University, Tianjin, China on October 20-22, 2017 (added January 2018). The Chironomid Home Page is YOUR place for finding researchers, news, and other resources regarding Chironomidae (Diptera), or non-biting midges. The webmaster would appreciate receiving any suggestions for further improving this site. Your participation is crucial - this is your community, and your resource. With this in mind, several requests. Please help the webmaster keep the worker directory current and accurate by communicating about those who should be removed from the worker directory, or have had their directory information (addresses, contact information, interests, etc.) changed. 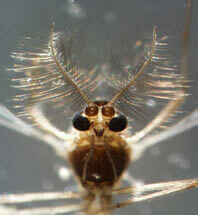 Second, please provide information regarding meetings, conferences, and research projects involving Chironomidae. Finally, to enhance the visual appeal and communicate to others what we do, please submit chironomid photographs of all life stages for inclusion in the Home Page. Proper credit, citation and copyright protection will, of course, be given. The webmaster thanks the work of Luc Int Panis (1995-1997) and Ian Walker (1997-2004) for founding and maintaining, respectively, the CHP. Your current webmaster thanks the UMMZ-Insect Division for hosting the website from 2005-2014. The CHP is now currently non-institutionally supported on a private server. New costs, but also new opportunities to improve the website and invite more participation.